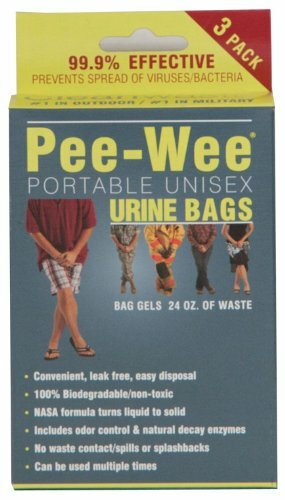 Pee-Wee unisex urine bags are great for family road trips, commuters stuck in traffic, aircraft pilots, utility workers on the job, truckers between stops, hunters and fishermen who have to ‘go’ when normal plumbing facilities are not available. Display tray contains 24 3-pk cartons. Also available in 12-Pk carton. EASY. NASA formula turns 24 ounces of liquid waste to solid in seconds. SAFE. Slip-resistant collar makes it easy to use by women and men. No waste contact, spills or splashbacks. EFFECTIVE. 99.9% effective against spread of viruses or bacteria. GREEN. 100% biodgradable and non-toxic for disposal in normal trash. RESEALABLE. Snap-close bag. No waste contact, spills or splashback. Good for multiple uses. If you have any questions about this product by Cleanwaste, contact us by completing and submitting the form below. If you are looking for a specif part number, please include it with your message.